Happy Friday! Woo hoo for holiday weekend. Today I have another so-so attempt at watermarbling. I don't know why I'm having so much trouble with it lately! I'm going to try to do it every week on Fridays to try to get better. I know it takes a lot of practice! At least this time I didn't have any air bubbles, so that's improvement. This design is by Colette of My Simple Little Pleasures. 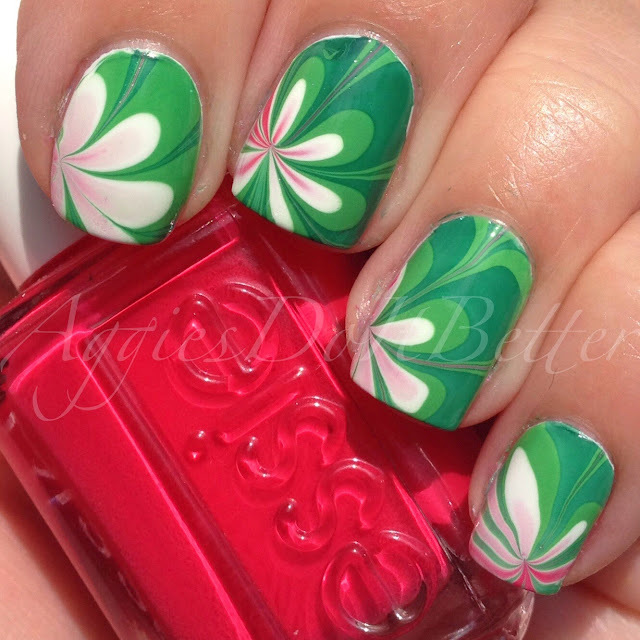 She has a million You Tube tutorials on watermarbling, seriously, check her out! But....wait until you have some time because you will get sucked in! I discovered her channel searching for tutorials and found this one first. It's supposed to look like Watermelon! I don't know why my pink kept disappearing :( and my nails are super short right now so that's a challenge also! But I know I can master this look and technique on short nails so I'm going to keep practicing! Search My Simple Little Pleasures or Watermelon Watermarble on You Tube if you want to see the look I was going for! base is white nails-also Sally Hanson.